Mastering the art of juggling isn't easy, as most parents well know. Childcare, work, housework, other family obligations—there are always a whole lot of balls up in the air. And then there's y-o-u and your needs, which often don't even make it into the mix. 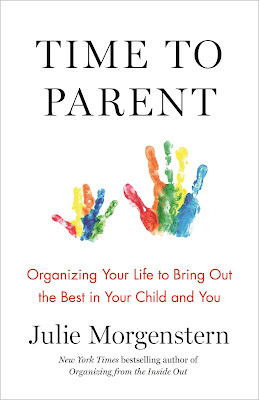 Thankfully, there’s Julie Morgenstern, a brilliant organization consultant and bestselling author I’ve known for years. 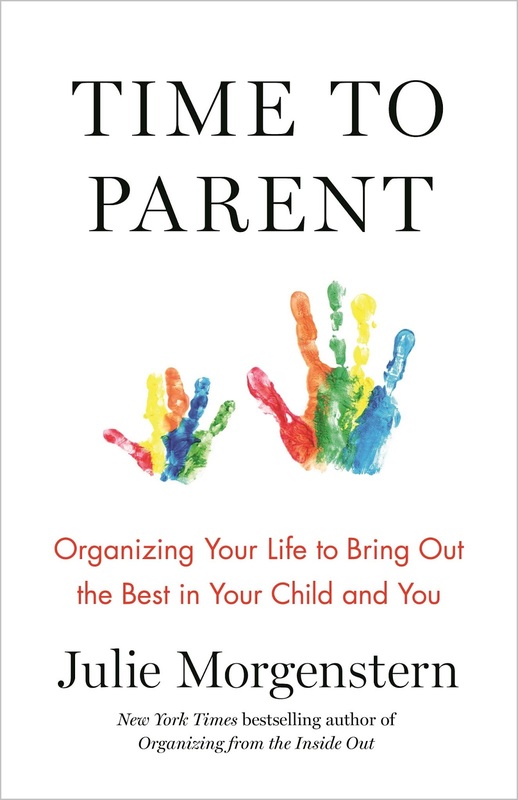 I’ve put some of her tips into practice and now, there’s a dedicated book to help moms and dads—Time to Parent: Organizing Your Life to Bring Out the Best in Your Child and You. It enables parents to carve responsibilities into manageable, achievable tasks, and offers strategies for finding more time for your relationship, yourself, good sleep and—yes!—fun. I’m sharing a few tips from the chapter “Four Time-Management Skills You Must Master.” The first is one I’ve used for years and every single time I’ve told it to someone, they’ve mentioned how helpful it is. MAX: Bake a cake from scratch, in the shape of your child’s favorite character, with party favors for each child. MOD: Bake cupcakes from a boxed mix with frosting from a can; top your child’s cupcake with a little figurine of his favorite character. Once you’ve defined the three levels of performance, you can choose the one that’s most appropriate for the circumstances, the time you have available, and what else you have on your plate. Sometimes you’ll choose MAX, sometimes MOD, sometimes MIN. You're breaking the all-or-nothing thinking that leads to overwork or paralysis, and recognizing you have options. When you catch yourself revving the engines of perfectionism, stop to consider what’s most important. Is it to get the thing you’re working on to a flawless state, or is showing up in the state of mind ready to connect with your kids, spouse, coworkers, friends? You can obsess over every word of a PowerPoint presentation for work OR you can rehearse a few times and be ready to take questions. You an squeeze in one more errand while your kid finishes up with his math tutor OR you can just relax and be ready to greet your kid when he’s finished. The goal is to the find the most efficient and effective way to get things done, not the most exhausting. Consciously preserve your energy for your attention, your grain, and your heart wherever you are going, and for whomever you are with. When delegating, be clear about what really matters. One of the hardest things about delegating—especially when your children are involved—is that everyone has their own way of doing things. The key is to boil your basic requirements for what “good” looks like to three (or fewer) criteria. For a babysitter, that might mean: 1) keep the kids safe; 2) don’t give them sweets (because it makes putting them to bed even harder); and 3) make sure they finish their homework. Delegation will go much more smoothly if you, as the delegator, decide what success looks like and tell your babysitter before they start the task. Master transitions between work and home. 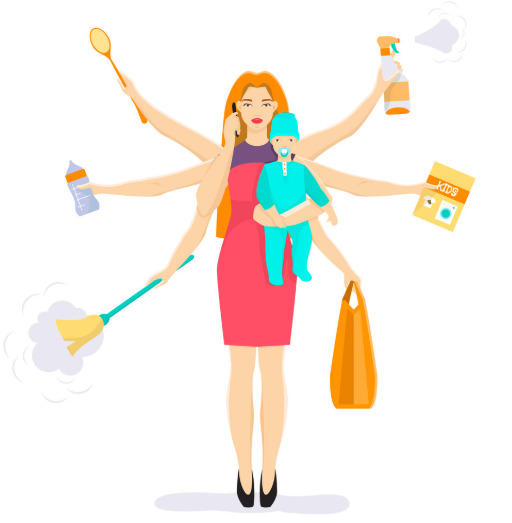 The most common challenge working parents share with me is, “I walk in the door after a long day and just need a little space before I can handle my kids and the house and all that stuff.” But kids don’t get that you need a little time to clear your head—they’ve been missing you! When walking through your front door, instead of thinking about your workday or to-dos shift your focus. Ask yourself, “When I walk through the for, what is my intention?” Maybe it is to be present for your kids and partner, or to make your family laugh. Park your phone at the front door. In the Japanese tradition, there is a station by the front for where everyone removes their shoes and puts on slippers. It’s an act that not only keeps dirt out, it also sets the tone for the home as a sacred space. You can do the same for technology. Consider creating an attractive and permanent docking stage—a beautiful storage box by the front door—where everyone parks their cell phones upon entry. A sign above the station, with an inspiring phrase like BE HERE NOW or LOVE THE ONE YOU’RE WITH can communicate the spirit of your family values. During designated times, family members can retrieve their phones from the docking station but otherwise, the physical separation can make it easy for people to be present and more conscious about their use of technology. Excerpted with permission from Time To Parent. I am SO trying that first one, at the very least. Brilliant! Sounds like a great book, I will check it out.